Guys! Over on my Instagram I’ve started Plant Tip Tuesday, where I share a little tip to do with plants each week. Last Tuesday I shared a tip on what to look for when buying a Fiddle Leaf Fig, and realised I could really dedicate a whole blog post on it! Not because buying a FLF is tricky or daunting, but because I wanted to share a few tips on what to look for when buying a healthy plant, and how you can expect yours to (somewhat) grow, based on how it looks when it’s in the nursery. So often I’ve picked up a plant in the nursery, given it a once over and brought it home only to discover there’s something wrong after I’ve bought it. But there’s a few things to look for before you buy to avoid getting a plant that could die once you get it home, leaving you wondering what you did wrong! Most of these tips could be applied to all plants, but I especially wanted to talk about FLFs, as they are so popular right now and are a little bit of my expertise! The first thing you should look for is if the plant generally looks healthy. This means no damaged or discoloured leaves. Unfortunately, plants are not regenerative so if a leaf is damaged or browned, it will stay like this. I often see big, gorgeous FLFs in the nursery, but they haven’t been taken proper care of and some of the leaves are brown and spotted. Its a shame because they will stay like that, and who wants to pay so much money for a mature tree that has forever damaged leaves! Take a closer look to check for pests. Look for anything small and moving on the leaves, check the undersides and look for small damage such as holes, discolouration or dots. As well as not wanting a pest-infested FLF, if you bring one with bugs home, it can threaten any other plants you have too! Next, check the base of the plant. FLFs can vary from the nursery – some have a single trunk in a pot, while others will have a cluster. This is up to you what you would prefer – keeping in mind how it will look when it grows. A cluster will appear naturally bushy while a single trunk will more easily replicate the popular ‘tree’ form once it grows. These things can be changed, but it’s always easier to start with a plant closer to the look you would like to achieve. Similarly, check the shape – pull back leaves and look if there’s any branches etc. They will be more prominent as the plant grows. You can always prune unwanted branches but it’s good to be aware of what style you’d prefer. This was my first Fiddle Leaf Fig! Another thing to keep in mind with FLFs is that they have thin trunks. To help strengthen their trunks, look for a plant where the leaves are growing close together on the trunk. This will provide support to the trunk and help stop it from leaning. If you look at the photo below, you might initially prefer to buy the FLF on the left, as it is taller. But height isn’t everything! The FLF on the left has less leaves and they are far apart on the trunk. This is a sign that the plant needs more sunlight. Having leaves further apart on the trunk also means the trunk is less supported, more likely to lean, and not getting as much nutrition to these areas to grow the trunk strong. 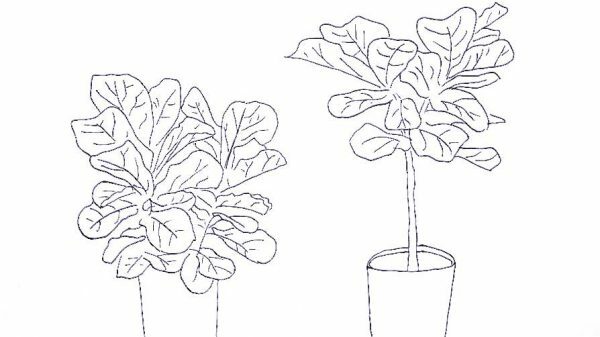 The FLF on the right may be shorter but will eventually be stronger and more supported, because the leaves are so close together. You can see that they’ve had to stake the FLF on the left, while the FLF on the right is freestanding. Lastly, check the bottom of the pot – see if there’s any roots showing. A lot of plants in nurseries can be root bound and ready to repot. This is good to know so that you can arrange a pot that is a little bigger than what its in now. 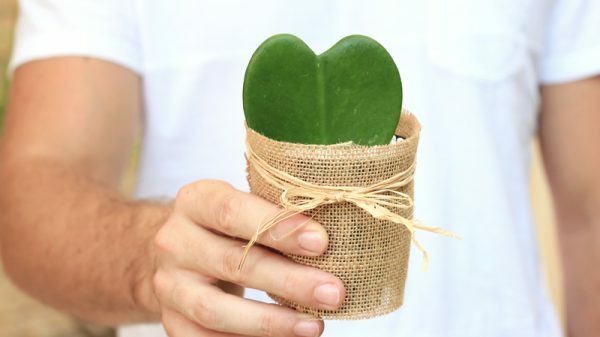 Hopefully these tips will help you bring home a healthy Fiddle Leaf Fig, as well as knowing a little more about what to expect as it grows. If you have any other things to look out for, let me know in the comments below! If you’ve recently brought home a FLF, check out my other tips on FLFs, including pruning, fertilizing and optimizing the growth and caring for your FLF. I’ve heard that there’s a “file” that you use to file down a FLF. Is this true? Do you use one? I rotated my new-ish FLF and noticed that it has some reddish discoloration behind some of its leaves. I don’t know if the discoloration has always been there or if this is a new development since I got it in August. Hey MJ, its a bit tricky to know what it could be without seeing it, however if it is clusters of reddish brown dots, it could be oedema. This is caused by an excess of water in the leaf cells but isn’t too worrying. If your plant seems otherwise healthy and growing, the discolouration shouldn’t cause any issues. It if gets worse, check you’re not overwatering and look for any signs of pests. All the best!